We’re often asked, “Why would we need unclaimed property consulting?” We usually answer that question with a few of our own. How does your organization currently manage escheatment compliance? Do you have comprehensive policies and procedures already in place? Does your company have a history of mergers and acquisitions? Do you fear that you have significant unclaimed property exposure? Do you have IT systems, internal controls, and an accounting infrastructure to support ongoing compliance? Have you been avoiding the issue of unclaimed property compliance—hoping that auditors don’t come knocking on your door? If you’ve ever been asked these questions or asked them of yourself, you aren’t alone. Across industries, organizations large and small often avoid or ignore the complexities of unclaimed property compliance. And yet, addressing the challenges head on is typically the most efficient and cost-effective way to avoid lengthy audits and costly penalties and interest.  The economic downturn and growth of state budget deficits have resulted in abandoned property regulations that are constantly changing – making it more important than ever to have a true partner for your unclaimed property consulting needs. If you have questions or wish to speak with a member of the Keane team, call 800-848-8896 or email us at Questions@KeaneUP.com. You can also speak with a member of our Unclaimed Property Consulting Team here. From compliance assessments and audit assistance to estimation techniques, supporting work papers, and comprehensive policies and procedures, our team can handle any unclaimed property compliance challenge that comes your way. Our team, comprised of former internal auditors, state administrators, and unclaimed property experts, is committed to staying abreast of the ongoing changes to state legislation as well as to unclaimed property policy and procedures. We will ensure you have the right solutions in place so compliance is achieved and maintained. Keane’s National Advisory & Consulting Team will conduct one-time or periodic reviews of your company’s escheat reporting practices, policies, and procedures to determine the right strategy. We will ensure that you’re reporting what you must, while taking advantage of cost-saving opportunities through the application of allowable exemptions and deductions. We also assist with first-time filing and negotiating amnesty with the states. If an audit should occur, our unclaimed property consulting team has state, industry, and Big Four expertise that proves invaluable when managing audits initiated by states or third parties. As your advisor, we will guide your team and company through the tedious process of addressing auditor requests and handling state negotiations. Our experience with unclaimed property audit procedures will help us ensure an efficient and accurate determination of your organization’s liability while protecting the confidentiality of applicable records and limiting scope. We can help you establish an annual unclaimed property reporting process that will allow your organization to ensure compliant, accurate, and timely required mailings and filings for less than it costs to utilize internal staff resources. Your Keane consulting team will customize a timeline, workflow, and reporting cycle specifically for your organization to ensure your unclaimed property compliance processes are efficient and effective. Since we are committed to staying at the forefront of the industry, our consultants continually share our knowledge and insight with our clients. We have a range of valuable educational services and resources to which you will have full access as a Keane client, including our whitepapers. If your business needs assistance managing unclaimed property compliance, or if you’d like additional information, call us at 800-848-8896 or email us at Questions@KeaneUP.com. You can also contact a member of our Unclaimed Property Consulting Team here.